On Sunday, Oct. 7, the PHHS Circle of Friends sponsored a picnic at Allied Gardens Park. 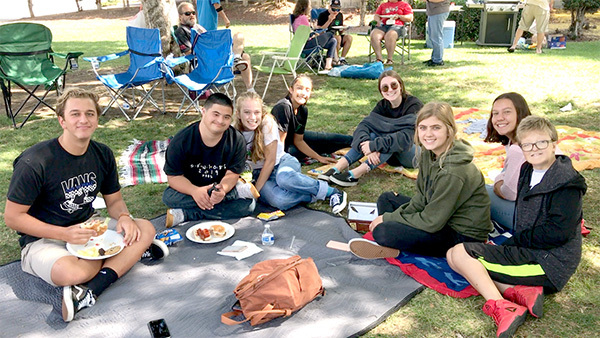 Circle of Friends is an ASB club at Patrick Henry that creates and fosters friendships between students with special needs and their non-disabled peers. Henry has over 50 general education students who are actively involved in the club. The club sponsors several off-campus events each year including a picnic, Winter Holiday Dance, and End of the Year Banquet. Students also eat lunch in a specified area each Monday and Tuesday in order to spend time together and build relationships. Jim Achenbach and Tianna Reitman are the facilitators of the club and help the students coordinate all of the fun with co-presidents, Joy Churchill, Alyssa Lozano and their student board. The student board also meets weekly to discuss and upcoming events. The students with special needs enjoy spending time with their general education counterparts and it creates a more welcoming environment at Henry as students wave and greet each other in the hallways. Students with special needs also feel more comfortable in the general education classes as they already know some of the students that are enrolled there. Patrick Henry High School (PHHS) is proud to announce that we had two students earn recognition for having exceptional academic promise demonstrated by their outstanding performance on the qualifying test used for the program entry. Maya Rozenshteyn and Sarah Kosci are proudly representing Henry High School with this great honor. 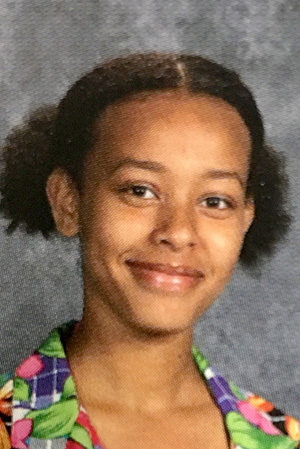 Their high scores on the PSAT (Preliminary SAT) placed them in the top 2 percent among 16,000 other semifinalist students in the country out of the 1.6 million students who took the assessment. Their semifinalist status earns them a chance to qualify in the spring as a finalist where they may earn merit scholarship award money. 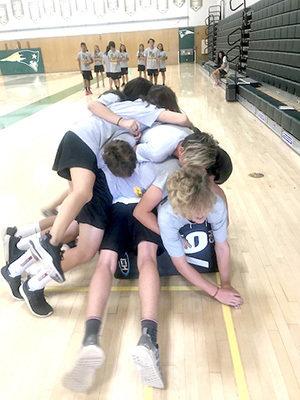 Physical literacy is a term that encapsulates all of what a public education high school physical education class should look like: learning, growing, challenging and changing. Students are focused on not just activity for activity’s sake, but for the purposes of growth, both mentally and physically, understanding the “why” of movement and skill, not just the “how.” It is the hope of this freshman physical education teacher to take them on a journey through their freshman year that moves them toward a life of health and wellness beyond their physical education class experience. Play and activity are great, but when students understand the how and why of those concepts, they own what they have learned and are capable of using it for purposes that will carry them far beyond the class. We have loved working with Mulugueta and will wish her well at her new school! Born in 1934 in Durban, South Africa, Arun Gandhi is the fifth grandson of India’s legendary leader, Mohandas K. “Mahatma” Gandhi. Growing up under the discriminatory apartheid laws of South Africa, he was beaten by white South Africans for being too black and black South Africans for being too white; so, Arun sought eye-for-an-eye justice. However, he learned from his parents and grandparents that justice does not mean revenge, it means transforming the opponent through love and suffering. Grandfather taught Arun to understand nonviolence through understanding violence. “If we know how much passive violence we perpetrate against one another we will understand why there is so much physical violence plaguing societies and the world,” Gandhi said. Through daily lessons, Arun says, he learned about violence and about anger. 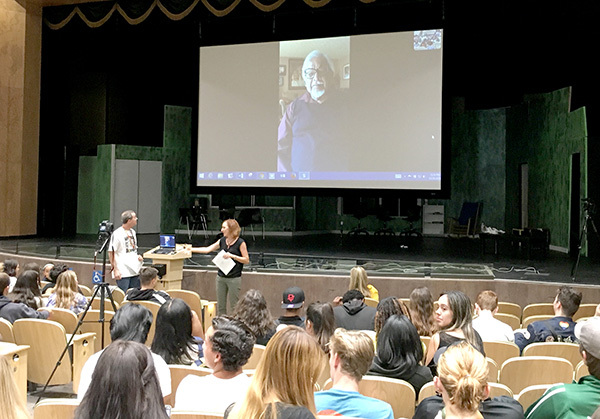 Arun shares these lessons all around the world and on Oct. 26, he Skyped with Erin Mangahis’ English classes during fifth period in the PHAME building. The students had the opportunity to hear his message on non-violence and learning about controlling your anger and using it for good to make the world a better place for all. Students were able to ask him questions directly immediately following his presentation. Arun is very involved in social programs and writing, as well. Shortly after Arun married his wife Sunanda, they were informed the South African government would not allow her to accompany him there. Sunanda and Arun decided to live in India, and Arun worked for 30 years as a journalist for The Times of India. Together, Arun and Sunanda started projects for the social and economic uplifting of the oppressed using constructive programs, the backbone of Gandhi’s philosophy of nonviolence. The programs changed the lives of more than half a million people in over 300 villages and they still continue to grow. Sunanda died in February of 2007 and the family is working to establish a school in the poorest rural part of India in her name. Arun is the author of several books. The first, “A Patch of White” (1949), is about life in prejudiced South Africa; then, he wrote two books on poverty and politics in India; followed by a compilation of M.K. Gandhi’s “Wit & Wisdom.” He also edited a book of essays on “World Without Violence: Can Gandhi’s Vision Become Reality?” And, more recently, wrote “The Forgotten Woman: The Untold Story of Kastur, the Wife of Mahatma Gandhi,” jointly with his late wife Sunanda. Encouraging students to study tuba can be a difficult sell at any school, but it is a critically important instrument in almost any orchestra. This year, tuba, baritone, and euphonium players will be invited to perform in Tuba Christmas San Diego at Patrick Henry High School, co-sponsored by the Patrick Henry Instrumental Music Program and the Cowles Mountain Community Foundation on Dec. 8 in PHAME. Tuba Christmas has occurred in almost every city in the United States for 45 years, inviting all tubists, young and old, novice and virtuoso, to perform in a nonthreatening environment. It is particularly important for tuba students to develop a positive association with the instrument and to encourage their music by playing with other musicians, both professional and amateur. Morning rehearsal starts at 8 a.m. Musicians will register for $10 and receive a book of nondenominational, seasonal holiday music for $20 or $25, depending on size. Musicians will set up their chairs and stands themselves. They will be encouraged in advance to bring a towel for their instrument. They will then rehearse until noon, breaking for lunch. The afternoon concert starts at 1 p.m. There will be a free sing-along concert, open to the community. Musicians will be encouraged to put away their chairs and music stands, as well as have the audience pick up after themselves. No food or drink allowed in the facility. Attention all parents and community members. Are you watching kids scroll through life, with their rapid-fire thumbs and 6-second attention spans? Physician and filmmaker Delaney Ruston saw that with her own kids and learned that the average kid spends 6.5 hours a day looking at screens. She wondered about the impact of all this time and about the friction occurring in homes and schools around negotiating screen time — friction she knew all too well. In “Screenagers,” as with her award-winning documentaries on mental health, Delaney takes a deeply personal approach as she probes into the vulnerable corners of family life, including her own, to explore struggles over social media, video games, academics and internet addiction. Through poignant, and unexpectedly funny stories, along with surprising insights from authors, psychologists, and brain scientists, “Screenagers” reveals how tech time impacts kids’ development and offers solutions on how adults can empower kids to best navigate the digital world and find balance. PHHS is offering this special screening in PHAME at 6 p.m. on Nov. 29 for $5 (adults) and $2 (children) to help all parents (any age level) be prepared for how to set the parameters and boundaries for their own children. Please review the movie trailer at screenagersmovie.com for more information. —Elizabeth Gillingham is principal of Patrick Henry High School. Dec. 8: Tuba Christmas in San Diego, Free entrance at 1 p.m.
Dec. 13: PHHS Choir Concert, at 6 p.m.
Dec. 19: PHHS Instrumental Music Concert, at 6 p.m.
Jan. 10: PHHS Airband Concert, 4–6 p.m.
Feb. 20-24: PHHS Drama Dept. presents “The Addams Family,” nightly at 6 p.m.
March 14: PHHS ASB presents their Variety/Improv Night at 6 p.m.
March 21: PHHS Choir Concert, at 6 p.m.
April 24: PHHS Pops Concert in PHAME at 6 p.m.
May 23: PHHS Choir Concert, at 6 p.m.
May 30: PHHS Instrumental Music Concert, at 6 p.m.
*Most events at PHHS will sell tickets for $10 each, unless noted otherwise. Please check our website for updates as some events are subject to change.